Beautiful Sonoma Valley is your destination on this laid-back, fun-filled, all-day tour. 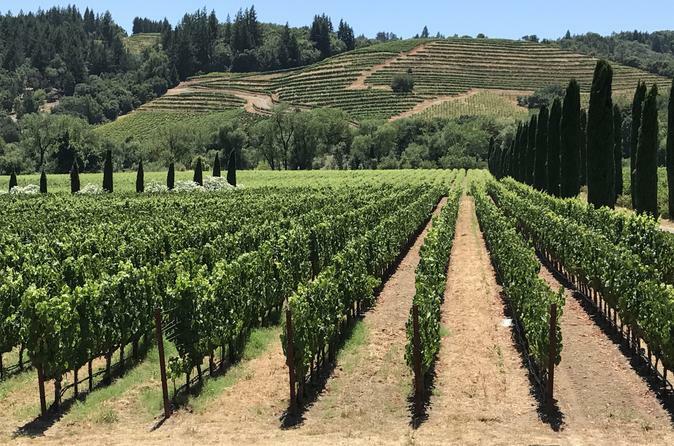 You will learn much about the region from your friendly and knowledgeable guide and will have the opportunity to sample many of the delicious wines that have made Northern California a world-renowned wine producing region. You will travel with a small group (limited to 12 people) to three of Sonoma’s finest boutique wineries where you will spend approximately one hour at each winery. This journey also includes a stop in scenic Sausalito, a stop at the Golden Gate Bridge, and a lunch stop in the historic town of Sonoma where you can select from one of the many fantastic restaurants on the square. If you’re feeling adventurous you can even take a walk into the past at Mission San Francisco Solano. Tasting fees at all wineries are included! Your adventure begins with a pick up from your hotel/accommodation in downtown San Francisco at 9am. Get to know your travel companions for the day as you head out of town and across the Golden Gate Bridge. You will learn about San Francisco's fascinating history as you travel northward and take in the beautiful scenery on your way to Sonoma Valley. Once in Sonoma you will visit three carefully-selected boutique wineries, where you will experience excellent hospitality as you learn all about wine and what makes this area one of the premier wine-producing regions on the planet, all while sampling many delicious local wine varietals and blends. Your lunch stop (at your own expense) will be in downtown Sonoma where you can wander the beautiful plaza and select from one of the many fantastic restaurants on the square. You can have a look at one of California's oldest settlements at the historic mission, or you can check out the many boutiques and gourmet shops. Your journey back to San Francisco will include a short stop in the scenic, seaside village of Sausalito, where you will have the option to stay and return to San Francisco via a cruise across the bay (the cost of the ferry is not included in the price of the tour). From Sausalito, the tour makes one final stop to take in majestic views of San Francisco and the Golden Gate Bridge, and then you will be dropped off back in San Francisco between 4:30-5pm. This small group tour is designed for travelers who seek an intimate experience where they can make new friends, learn a thing or two, and have fun in a very laid-back environment.